Today, automation tools are largely isolated and segmented into their own fiefdoms. A website chatbot doesn’t typically interact with a customer service employee unless it is programmed to hand off a conversation if certain conditions are met. The chatbot just follows its programming, never altering course unless it’s ordered to do so. When we develop a system like this, we first figure out what we want to automate; then we design and develop the bot to operate for its specific purpose. But all of this is changing from the ground up. Here’s what the future of automation looks like: Rather than determining a process that we want to automate, a machine learning agent will observe the way we work, collecting and mining historical data to determine where opportunities for automation lie. The AI tool will then hypothesize a solution in the form of an automated process change and simulate how those changes will improve productivity or lead to better business outcomes. From there, the optimized, automated process will be implemented within the working environment, seamlessly integrating itself into our jobs, with the goal of reducing repetitive, manual efforts — the so-called “busy work” that eats up so much of the day. This combination of human and digital labor is called orchestration. When used throughout the enterprise, orchestration allows us to craft a gold standard of automation-driven best practices that can be standardized across the entire organization. These tools will constantly monitor their own performance (and could also monitor employees’ performance) and improve their own algorithms as additional data is captured, getting better every day while applying their learnings to other challenges that feature related problems. For example, an algorithm that routes incoming customer service emails might ultimately adapt itself to route internal employee evaluation documents. Intelligent automation has applications across a wide range of job roles, disciplines, departments, and sectors. It can be used for everything from improving messaging to assigning billing codes to streamlining external marketing initiatives. But while ML-driven orchestration will find plenty of applications in clerical-type work, it isn’t limited to routine tasks like sending automated email responses to customer inquiries or onboarding new employees. Imagine an insurance agent who develops complex policies for his clients, based on exhaustive surveys that detail their particular needs. These policies might take hours to build — developed piecemeal from deep catalogs of variable terms, costs, and benefits. It may be a straightforward process, but it’s also a time-consuming one that requires considerable attention to detail to ensure that nothing is overlooked. Intelligent automation eliminates nearly all of this effort. An intelligent microbot could observe the workflow of the insurance agent, uncover where too much manual effort is taking place, and determine where automation could both streamline the workflow and improve the finished product, all without involving the agent directly. While the agent would maintain oversight, he would be freed from the more mundane aspects of the job, as the microbot would compose the policy on his behalf, letting the agent focus on the big-picture task of better serving his clients. One of the goals of intelligent automation is to extend this benefit to everyone across the organization. You shouldn’t need to involve the IT department to take advantage of automation, as these tools are being built to jettison what was once a very arduous and technical process and make it much more user-friendly. The insurance agent example above may sound complex, but, at its heart, it’s a fundamental problem that every knowledge worker has: having to invest long hours in a repetitive process that doesn’t make the best use of that professional’s time or skill set. The ideal intelligent automation toolkit is designed to be approachable by everyone, and organizations won’t need a staff of data scientist to implement it. Consider another business case that almost every large enterprise struggles with: the call center. The call center is a great example because we can see quite clearly how it works and is run, what call center agents do, and how they handle each call. Much energy is expended in monitoring calls, determining the type of call, and routing it appropriately. Call center managers often pride themselves on having access to a mountain of information about every call that comes into the center. So let’s start to apply basic automation to that department. A straightforward AI tool, like one that exists today, might decide that the best customers should wait the least amount of time. This is a strict algorithmic approach that shunts some callers to the website, provides other callers a canned response, and quickly escalates VIPs to a more experienced agent. The AI tool uses rules and logic to make these decisions, but there is no sense of human empathy here. The AI tool can’t feel the frustration in a caller’s voice, and it doesn’t care that a harried mom who’s late to pick up her kids has been on hold for an hour. By bringing an orchestrated, intelligent automation tool to the mix, the system can learn from studying the interactions of all the agents with all the callers, rather than simply relying on a set of static, predetermined rules. It’s not the same as human empathy, but the bot’s ability to adapt (or “self-heal”) moves the needle in that direction and produces measurably better results over time. By observing the way humans react to various calls, the automation tool becomes increasingly better at making decisions about how to handle those calls without human intervention. The ultimate result is happier customers and more engaged and productive call center operators. This may sound fanciful and futuristic, but tools like this are already beginning to come onto the market. By 2019, they should be in widespread use in a range of industries. That’s not to say these tools are unilaterally ready for the limelight, because intelligent automation has a few challenges that we’ll need to overcome as the technology enters the mainstream. Trust is one of the biggest issues. Marketing emails and billing codes are one thing, but can people trust bots with financial transactions and human resources information? When sensitive data like healthcare records and credit card numbers get involved, it’s natural to fear that something could go haywire thanks to a misplaced line of code. 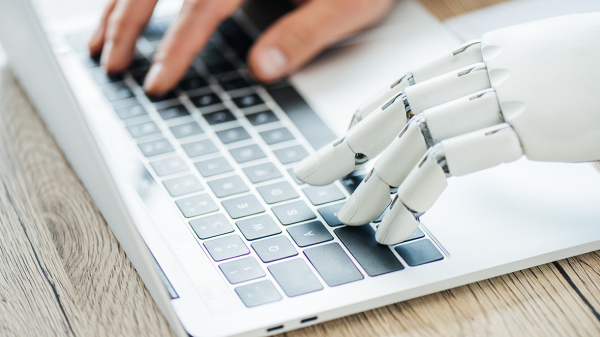 Intelligent automation bots will need to overcome these fears before we trust them enough to put the full weight of the business on their shoulders. Data standardization is another challenge. Data is stored in innumerable formats, dozens of programming languages are common, and the number of applications with which bots will have to interact likely numbers in the thousands. How do bots utilize all of these data sources and formats? And who is responsible for managing the bot swarm? Lastly, how do we keep bias from creeping into intelligent systems? Will a developer’s bias creep into his or her algorithm? If a bank’s loan manager is applying different standards to minority applicants, does the bot learn that behavior and make discrimination part of its internal process? Situations like these give rise to ethical issues that have not been fully discussed — but they need to be. These challenges needn’t be daunting and can begin to be addressed through rigorous governance in the enterprise. Smart enterprises are getting ahead of the game (and dealing with some of these challenges) by developing a framework for governance over automation, which spells out approved tools and security protocols that bots can utilize. In some companies, business processes are being reinvented as well, so automation can be implemented more successfully. Others are adapting their operating model to embed more technology directly in the business. While we have a way to go, intelligent automation is already proving its value. This suite of technology provides a demonstrated way to reduce expenses, improve productivity, and enhance employee satisfaction. And as automation becomes more intelligent and more meaningful, all of these factors will continue to improve — sometimes dramatically. As we rethink all kinds of processes from end to end, we expect to see the rise of numerous, entirely new value propositions, all driven by the power of intelligent automation.